TenTrix is a fantastic puzzle game in which you must attempt to fix a range of multi-colored pieces onto a set 10×10 playing board. 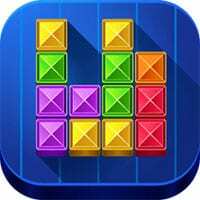 The game uses similar mechanics to the classic puzzle game Tetris. But instead of the pieces slowly falling down to the bottom of the level. You instead have a set playing field to fill. Work as fast as possible to fill the board and to place the pieces effectively. As you progress the pieces appear quicker. So you must think fast and keep moving them about to create complete lines on the board. Can you conquer TenTrix Game and prove your skill as a puzzle master? TenTrix Game is one of our Puzzle Games at Round Games. It is also tagged as a tetris and logic game. To play even more free games, view our most played and all games pages. If you want to play more games like TenTrix Game: Then you can simply check out the games inside the game tags that are the most relevant to your interests or check the Puzzle Games category or check the related games section at the end of the game page.